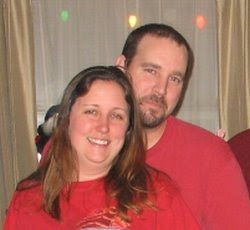 Today Mike's brother Jeff will be marrying his fiance Kelly. I wish them all the luck and happiness life can offer. I'm really excited to attend a wedding..being that our wedding is coming so soon. It makes it that more exciting! I'm also going to try my damnedest to catch the bouquet!! Congratulation Jeff and Kelly! I hope your day is however you dreamed it would be. I can't wait to show all of you pictures! !